Freshly renovated, this 3 bedroom 2 bath condo makes a perfect place to spend your next beach getaway! Tranquil blue walls, calming grey floors and tasteful beach themed decor will make you sigh a relaxing “ahhh” from the moment you walk through the door. 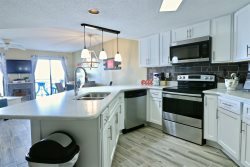 The first thing you’ll notice is the newly upgraded kitchen with beautiful new countertops, stainless appliances, and an oversized fridge. When you walk past the kitchen you’ll find your open living room/dining room area. A large plush sofa, matching accent chair, and comfy lounger gives you plenty of options to sit back and relax after a long day at the beach! Past the living room you’ll find the master suite with an inviting queen size bed, beautiful double vanity, and a newly tiled, spacious walk-in shower. The first guest bedroom is furnished with a twin bed and a queen bed and includes a wall mounted flat screen television. Tasteful seashell accents adorn the second guest room, equipped with a queen size bed, spacious closet and wall mounted flat screen tv. The full sized hall bathroom, with its beautiful sky blue walls, pleasing grey accents and newly tiled shower/bathtub combo make it a perfect place for a relaxing soak after a long day playing in the sand. Wake up, pour yourself a cup of coffee and relax on the furnished balcony. Cook up a hearty breakfast in the fully equipped kitchen and enjoy your meal at the 2 person breakfast bar or have a seat at the 4 person dining room table. Check the weather on the large wall mounted screen TV while relaxing on the comfy sofa before changing into your swimsuits and packing up the beach bag! When you finally step foot on our pristine beach you’ll instantly see why our white sand coastline is so famous. Our rolling waves and bright warm sun make for a perfect day filled with sand castle building, beach lounging and long swims in the Gulf of Mexico. If you forgot your beach chairs, it’s no worries! You’ll find a beachside rental company with chairs and umbrellas just waiting for your arrival. When you’ve caught as many sunny rays as you can handle, make sure to wash off your feet at one of our outside showers before taking a dip in our community pool. Or why not cook up some of our famous Gulf seafood using one of our outdoor community grills? When you’re finished with all your outdoor adventures, take the conveniently located elevator back up to your unit and don’t forget to put those wet beach towels in the washer/dryer located next to the guest bath so they’ll be fresh and ready for your next trip down to the beach. Complimentary starter set of trash bags, soap, dish detergent, coffee, etc. Most of our units only accept Saturday - Saturday reservations during summer time. Please call us if you are interested in booking different dates.